Appaloosa means tough, dependable, spirited. The Boker Appaloosa Classic Pocket Knife is dedicated to the famous Appaloosa horse. Characterized by their incredible strength and stamina, these horses can be distinguished by their unique coloring -- various shades of brown and white, in the form of irregular spots. This was the inspiration for the beautifully structured bone handles chosen for this series. The dark and light spots on the scales make each knife truly unique. 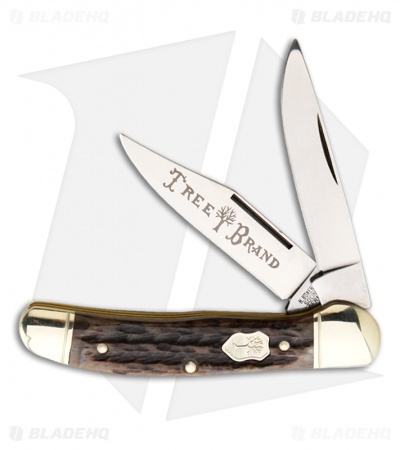 Boker has also designed a special new Boker shield, exclusively for this premium series. 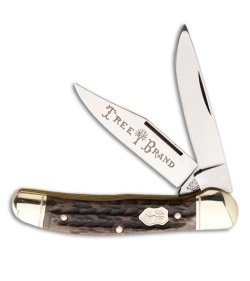 Each clip point blade and standard blade feature C-75 carbon steel with pocked texturing. Constructed with brass liners and polished nickel silver bolsters. If you are a gentleman, or know one, then you need this knife. PERIOD. I purchased this Boker Appaloosa as I was looking for a classy, timeless designed blade with exceptional craftsmanship and to try and get away from the "tactical, fastest, coolest, biggest and baddest" modern folder clique that is rampant. Don't get me wrong, I own many modern, high end folders that are exactly as described above, but for this one, I wanted to slow things down a bit and have a gentleman's knife on me that my grand kid's can hopefully one day hand down to their grand kid's. This knife pairs well with a fine cologne, a properly fitted suit, leather dress shoes, the finest cigars, a premium whiskey, and a healthy dose of class. This Appaloosa oozes German quality from the start. It just feels incredibly premium in your hand. The blades open smoothly and lock up with a solid thud and are held in place by great slip joint lock retention. The blades are made out of C-75, which to my knowledge is the German version of 1095 carbon steel with a slightly different blend of metals and heat treat, but don't hold me to that info entirely. But I knew it would perform well because my strongest axe is a Stihl Pro Forestry axe with a steel of C-60 and has held up beautifully, and I expected this steel to do so also for its similar make up and designation. The liners are brass with the bolsters being polished nickel silver so when holding this knife, it just makes you say "this feels premium". This is one of those blades that you feel proud to own, show off, and use. People have already asked me what it is and when I show them and they feel it they simply say "wow", or "this is incredibly good". Buy this knife. You will not regret it, nor will your grand kids when they pass it down to their grand kids. Excellent job Boker and also BladeHQ on the incredible shipping speed. There is a reason I only shop here for my knife needs any longer. BladeHQ and this Appaloosa just work like a mule.